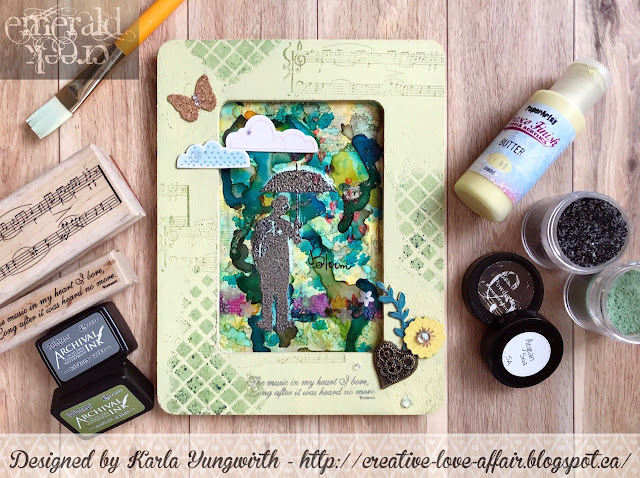 Today I have an extra social post because we are working with the Mixed Media Monthly Challenge for their Rust Challenge. Using the Baked Texture Chunky Rust from Seth Apter, I grabbed the Burnt Copper Leaves for an awesome combo and just loved taking a gold spin with the card. My Southern Ridge Chipboard frame, Tim Holtz Woodgrain Stencil and Filigree Frame Corner embellishments are going to get all sauced up with these EPs. My favourite ink is the ranger emboss it dabber because its think and gooey and can actually hold all of the chunks to chipboard without it drying in too quickly. I love how quick and easy these silver corners became rusted metal embellishments. Literally it took seconds to heat. Super simple to build. I used my Buttercream cardstock for the base and Arctic White for the stenciled and stamped layers. Gold metallic cardstock from Tim Holtz sanded, brown kraft core, and a variety of distress oxides and distress inks in Vintage photo, Iced Spruce, Fired Brick, Broken China and Emerald Archival Ink. I used collage medium to adhere the metal frame pieces and foam tape to raise the frame. Then add any quick saying, I chose my Vertical Word Stamp - Happy Father's Day so I have 1 less to make next month but it could have been anything. 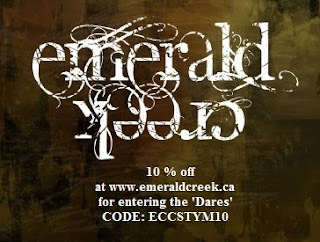 Christi please email Kim at info@emeraldcreek.co for your prize code. Love that special combo of powders! A wonderful project, Kim!!! I've made a card and am a first time enterer for your Dare Challenge. I'm just checking - this is a challenge for the whole month? It says the linky list is closed. Kim, I was excited to see you as GDT at MMM, and how generous of you to sponsor this rusty challenge! I love your rusted frame and embellishments here, and I've enjoyed using these Baked Textures a LOT! Hugs!